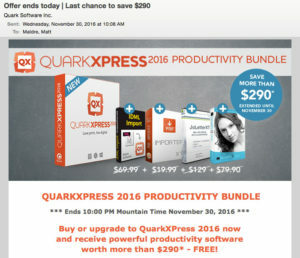 Quark XPress still sends emails to designers trying to convince them to purchase their dated software. 20 years ago Quark was the premiere layout program for print designers. Then around 2000 Adobe released their Quark-Killer, Adobe Indesign. Since that time 15 years ago, designers quickly dropped Quark in favor of Indesign. We haven’t looked back since. Yet, Quark is still there. Knocking on the door. You have to feel kinda bad for Quark. But honestly, their customer service back in the 90s was so bad, they were asking to be put out of business. Sorry Quark, I have good memories of using you in the 90s. In fact, I still use your key command combination “command-e” when I want to import a photo into Indesign. Apparently, some 15-year-old habits still stick around. However, you haven’t really stuck around. Instead Quark sends me an email about every other month. None of these emails ever say how they are better than InDesign. Or why I should switch from InDesign to Quark. Over the years, I sometimes email back asking for reasons why I should switch. I get no response. Their silence speaks volumes. I love vintage technology, like fax machines and Atari 2600 consoles. 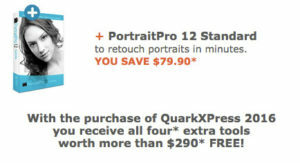 But QuarkXpress? Doesn’t quite have the appeal for me to play with.